"Dallas." The drama. The mystery. The intrigue. Specifically, where is Victoria Principal? In the update to the primetime soap, the TV show returns with some of the original cast intact, like Larry Hagman and Patrick Duffy. 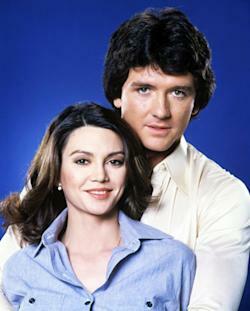 But Principal, who turned heads alongside Patrick Duffy in their roles as '80s super-couple Pamela and Bobby Ewing, is a no-show. In the original drama, which ran from 1978 to 1991, Bobby and Pamela were married. In the update, Bobby has a third wife, Ann (played by Brenda Strong), who carries on the mantle of the family matriarch. Fans are wondering whether Victoria Principal will reappear. In the original series, Pamela left Bobby -- and the show -- under mysterious circumstances and a terminal illness. But death -- or the suggestion of it -- didn't always stop a character from returning to the Texas-size drama. In fact, in a wild plot twist in the original, Bobby came back from the dead after an entire season was revealed to be a dream. Over the top? You bet. That's "Dallas," baby. The absence of the star was noted by viewers who commented on a Yahoo! TV post about returning star Charlene Tilton to the show, asking, "Is Bobby's wife Ann? (I know she isn't Victoria Principal.)" Another wondered, "Does he [Bobby] have a new wife on the show? Is Pamela's disappearance explained -- I dimly recall she might have died on the original show? Any back story on why Principal didn't join?" Points for paying attention! Entertainment Weekly also called out the absence of the '80s star, writing "Victoria Principal was missed" while noting Strong's enjoyable performance. Even the TNT website doesn't label Pamela Barnes Ewing as deceased on the family tree (as it does for Ellie Ewing, for example), but describes her as "twice married and twice divorced to Bobby Ewing, Pamela is the [adoptive] mother of Christopher." Still, Principal's fans shouldn't get their hopes up: Duffy has said Principal doesn't want to join the modern "Dallas." Duffy told the Winnipeg Free Press that his former co-star has "no desire" to get back to her old gig. In fact, Principal, 62, is a successful entrepreneur who launched her own skin-care brand and jewelry line. She's also a best-selling author. Duffy added that she is "very comfortable" with being absent from the acting scene. But never say never with "Dallas." Duffy himself points out that although Principal's character was deathly ill at the end of the series, her ending was mysterious. He told the publication, "I had to actually do research because I thought the character Pam died on the show, but it was pointed out to me that she just disappeared." Duffy added, "She sort of walked away to die peacefully, but we never got confirmation. So in that sense ... the potential is still there. It's rather thin, but the potential is there." Potentially, Principal could appear in a cameo. The TNT show, which picks up 21 years after the end of the original primetime hit, focuses on the next generation, including Bobby and Pam's adopted son, Christopher (played by Jesse Metcalfe). Stay tuned. "Dallas" airs Wednesdays at 9 PM on TNT.